Hartington. Visitor guide for the village of Hartington in Derbyshire. Hartington is centred on its square, village green and restored mere (or pond), and is a convenient centre for exploring the upper Dove Valley. The village stands at the centre of one of the biggest parishes in the country, divided into four quarters – Town, Upper, Nether and Middle, and is perhaps most famous for its former production of delicious Hartington Stilton cheese, which is still on sale in the village. Hartington is nine miles south east of Buxton and 12 miles north of Ashbourne, just off the A515 Buxton-Ashbourne road. It stands at the northern end of the valley of the River Dove, which is known here as Beresford Dale, on the limestone plateau of the White Peak. Just across the A515 at Parsley Hay north east of Hartington stands one of the Peak District’s most famous prehistoric monuments. 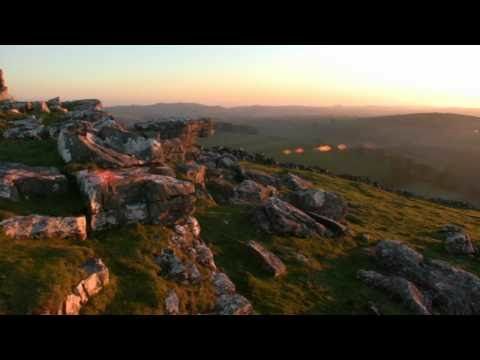 The enigmatic henge and stone circle of Arbor Low has been dubbed “the Stonehenge of the North”, and it dates from the same Neolithic period as its more famous Wiltshire counterpart. But Arbor Low still holds its mysteries. Approached through a farmyard on the minor Parsley Hay-Monyash road, the visitor has to negotiate a couple of stiles to reach the stones, all of which now lie prostrate on the ground within the earth-built henge. A Bronze Age burial mound is superimposed on the eastern bank, and a couple of fields away lies Gib Hill, another prominent burial mound with a fine view across the rolling White Peak plateau. The A515 Ashbourne-Buxton road faithfully follows the line of the Roman Road which linked their settlements at Derby (Derventio) and Buxton (Aqua Arnemetiae), constructed as they exploited the lead reserves of the White Peak. Pilsbury Castle, a two-mile walk north from the village, is one of the finest examples of a motte and bailey castle in the Peak. It was built as a timber castle on a limestone knoll commanding the head of the Dove Valley in the late 11th or early 12th centuries. The bailey (courtyard) and still impressive earthworks protected the entrance to the wooden keep which was constructed on the top of an earth mound. Pilsbury lay at the heart of the de Ferrers, Earls of Derby, Dovedale estates, and manorial courts where held at there as recently as the 19th century. But by the 13th century, the township of Hartington downstream had become the marketing and commercial centre. Hartington holds the record of having the earliest recorded market charter in the Peak. In 1203, King John granted the right for William de Ferrers, Earl of Derby, to hold a market every Wednesday, and also for a three-day fair at the festival of St Giles, the village’s patron saint, in his manor at Hartington. The remains of medieval boundaries and ridge-and-furrowed fields on the plateau north of Hartington show evidence of formerly extensive monastic granges – or outlying farms – at Cronkstone, Needham, Pilsbury and Cotesfield. Some of these granges belonged to the Cistercian abbey at Merevale, in far-off Warwickshire. There was a bloody battle between the Roundheads led by Sir John Gell and a Royalist force under the command of Colonel Dudley near Hartington during the Civil War in 1643. Dudley attacked Gell’s force of about 2,000 horse and foot and slaughtered over 100 of them on the moors between Hartington and the Staffordshire border. The stone-mullioned Charles Cotton Hotel is a reminder of one of Hartington’s most famous sons, local landowner Charles Cotton, who was co-author with Izaak Walton of the fisherman’s bible, The Compleat Angler, first published in 1653 and still in print. Cotton lived at nearby Beresford Hall in nearby Beresford Dale, of which only an ornate Fishing Lodge, built in 1674 and decorated with the entwined initials of Cotton and Walton, remains. Cotton is supposed to have hidden from his many creditors in caves in the dale. Beresford Hall was demolished in the late 19th century. Possibly one of Hartington’s most famous visitors was Prince Charles Edward Stuart (aka Bonnie Prince Charlie) on his ill-fated march on London in 1745. He is alleged to have stayed at the lovely Tudor mansion of Hartington Hall, south east of the village centre, which is now one of the most palatial youth hostels in the country. The five bay-fronted Newhaven Inn on the A515, currently under restoration, was built around 1802 by the sixth Duke of Devonshire as a staging post on the Buxton-Ashbourne road and originally called the Devonshire Arms. It was built at a busy multiple junction, where turnpikes linking Nottingham, Derby, Manchester, Sheffield and Cheadle all merged from five different directions. There are many remains of small lead mines in the fields around the village of Hartington, but no major mines seem to have been sunk in the vicinity. Many disused limestone quarries also exist in the parish, notably at Hartshead and near the former Hartington Station on the Tissington Trail. At Friden, across the A515 east of Hartington, rare exposures of silica sand are still used for the manufacture of refractory bricks for furnaces. Hartington lies close to the former Ashbourne-Buxton line, constructed almost at the end of the Golden Age of railways and opening as late as 1899. Designed to double track standards, it was eventually only built as a single track and in later years became little more than a branch line. It closed in 1967 under the infamous Beeching axe, and was converted to the popular walking and riding route now known as the Tissington Trail. As in many cases, because of the difficult hilly terrain, Hartington’s station had to be constructed some way (just over a mile) from the village. Only the Signal Box now remains, a building which gained a new life until recently as a National Park visitor centre, where visitors could operate the levers. Hartington's Parish Church of St Giles is one of the most interesting in the Peak District, dating back to around the 13th century. Tudor Hartington Hall, just outside the village on Hall Bank, is allegedly the place where Bonnie Prince Charles stayed on his ill-fated march on London in 1745, and is now a beautifully-restored youth hostel. You can actually stay in the oak-panelled bedroom where the ill-fated prince is supposed to have slept. This magnificent manor house was built by Robert Bateman in 1611, and is a typical Derbyshire three-gabled, stone-mullioned manor house of that period. Recently refurbished to a high standard, the hostel has 124 beds including family rooms. There is a lounge, dining room and bar. Dovedale is perhaps the most famous of the White Peak dales, and Hartington stands at its northernmost extremity, which is known here known as Beresford Dale. This means that it does not attract the same number of visitors as the southern reaches, and you can enjoy the serenity of the dale in peace (see Walking section). Neolithic henge monument, stone circle and burial mound to the east of Hartington. Although in the heart of well dressing country and not far from where it all began at Tissington, Hartington has only been dressing its wells for 20 years. Now on the second Saturday in September, Wakes Saturday, the colourful screens are erected on the green which overlooks the village mere (or pond). Hartington’s is one of the last well dressings of the season to be held in the Peak District. It is an easy two-mile walk from Hartington to visit Pilsbury Castle, the finest Norman motte and bailey remains in the Peak, commanding a strategic position at the head of the Dove valley. A stroll into Dovedale is a must from Hartington, and it is a short and beautiful walk down Beresford Dale, passing Cotton’s Fishing Lodge and the Pike Pool with its imposing fang of rock rising from it. You then pass through Wolfscote Dale to reach Dovedale proper and the amazing rock formations of the lower dale. Less busy but just as beautiful is the nearby Manifold Valley, threaded by the former railway line of the Leek and Manifold Light Railway, and now an easy, wheel- and-pushchair-friendly metalled track. You pass the awesome void of Thor’s Cave, surely the archetypal caveman’s dwelling high on a cliff above the valley, and Beeston Tor, where other evidence of early man has also been uncovered. Other easy and level walking is available on the Tissington Trail, a former railway line which crosses the White Peak plateau and commands fine views. You can hire a bike for various periods from the cycle hire centre at the former station at Parsley Hay, just off the A515 at the junction of the Tissington and High Peak Trails. Many miles of traffic-free cycling can be enjoyed on these level and undemanding former railway tracks, which are ideal for beginners or children, and there are plenty of picnic spots along the way. You cannot leave Hartington without buying a delicious, blue-veined Stilton cheese – dubbed the “King of English cheeses” – from the Cheese Shop, in Stonewell Lane. The shop also sells similar local varieties such as Dovedale and Buxton Blue. According to tradition, Stilton cheese can only be made in Derbyshire, Leicestershire or Nottinghamshire. The former Nuttalls Cheese Factory, off the village square, only just qualified, because it was a quarter of a mile inside the Derbyshire boundary. The famous Hartington Stilton was made here for many years. A special beer named Hartington Bitter is among the ales brewed at Whim Ales Ltd of Whim Farm, Hartington. Whim’s beers can be found in up to 70 outlets, including the Charles Cotton Hotel, in Hartington’s Market Place. The Charles Cotton also has an annual beer festival in October and serves a selection of real ales and meals, using local produce where possible, are available all day in the bar and tea room, and in the restaurant in the evening and at Sunday lunchtime. The Devonshire Arms, an historic 17th century coaching inn, is also in the Market Place at Hartington and serves a range of real ales. Snacks and meals are also available at lunchtime, with a la carte dining in the evening. Hartington has plenty of holiday accommodation. Choose from the healthy selection of b&bs, holiday cottages, pubs and hotels. See the full list of Hartington accommodation. Biggin Hall Country House Hotel does what it says on the tin and dates back to the 17th century. Also welcomes dogs. The Hayloft B&B is situated in a central but quiet location in Hartington with all village amentities nearby, with many walks/cycle trails from the door. Ashbourne TIC, 13 Market Place, Ashbourne, Derbyshire DE6 1EU; Tel: 01335 343666; www.peakdistrict.com; open daily. Manifold Valley Visitor Centre, Hulme End, near Buxton, Derbyshire SK17 0EZ; Tel: 01298 846679; www.enjoystaffordshire.com; open Easter-October. St Oswald’s Hospital, Belle Vue Road, Ashbourne, Tel: 01335 342121. The Surgery, Gibb Lane, Sudbury, Ashbourne DE6 5HY, Tel: 01283 585215; Brailsford & Hulland Medical Centre, The Green, Church Lane, Brailsford, Ashbourne DE6 3BX, Tel: 01335 360328; The Surgery, Clifton Road, Ashbourne DE6 1RR: Tel: 01335 343784; The Surgery, Waterfall Lane, Waterhouses ST10 3HT; Tel: 01538 308207.